Bushy herbaceous perennial to 3 feet tall. Native to the mountains and deserts of western North America. This plant thrives roadside, in sandy areas seasonally flooded, in grasslands on dry slopes, in waste places, rock garden, or regular garden soil outside the reach of sprinkler. Sand mulch for best results. In colder zones, may be grown as an annual, or may become perennial, dying back to the root. If your zone is too cold to support overwintering, be reassured that this is a reasonably dependable self-seeder. 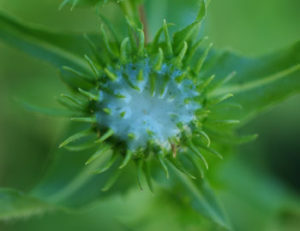 In warmer zones, the plant will produce a thick, rubbery, perennial stem that may be crowned by a rosette of green leaves, and gives rise, in season, to more stems, followed by the soft green cauldrons of resin, giving way to the bright golden yellow flowers, flattened, about the size of quarters, which then in turn give way to the seedheads. Traditional usage (TWM): asthma, poison oak and ivy. Plant prefers full sun and dryish, well-drained soils. Space plants 2 to 3 feet apart.